I needed to do a quick card for an overseas friend so decided to play along with the Speed Craft girls! This card took me 14 mins and 39 seconds (cutting it fine!) - although I confess the stickles was not dry in that time. 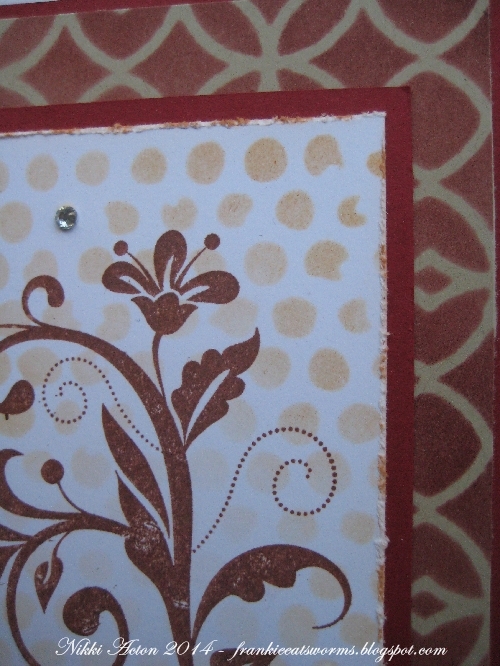 The theme is sparkle and shine - not excessive on mine but some stickles and lovely rhinestones. 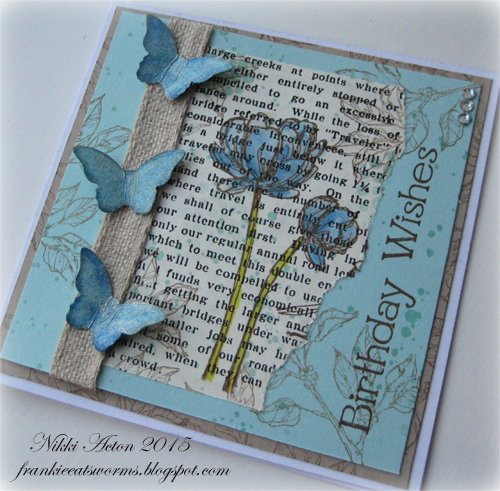 The inspiration for this card came from another Stampin Up demo - sorry I saw the card but don't know who made it! 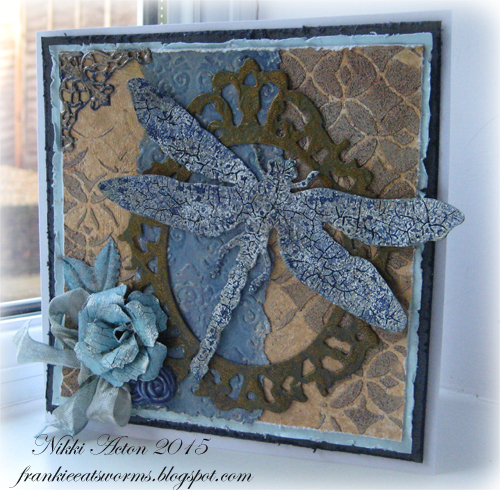 I have used different stamps and a different layout but some of the elements and the colour scheme are cased. I thought I would play along at Compendium of Curiosities this time, where the theme is Tim's Distress Water Colouring (part 2 on page 40). It is challenge number 20 and this time is sponsored by The Funkie Junkie Boutique. 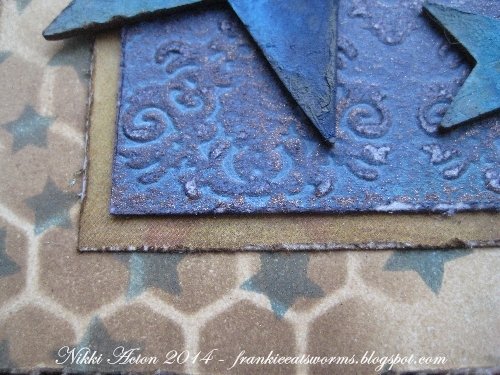 I took several of elements off different stamp sets and chopped them up and coloured them to make my tag. 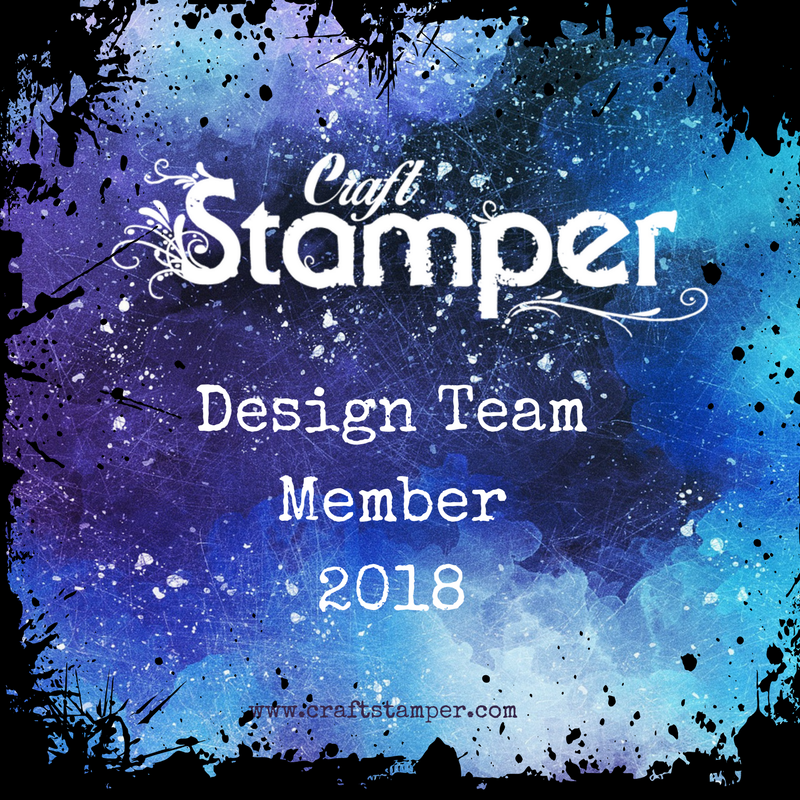 I would also like to enter my slightly quirky tag into the Craft Stamper challenge this month. 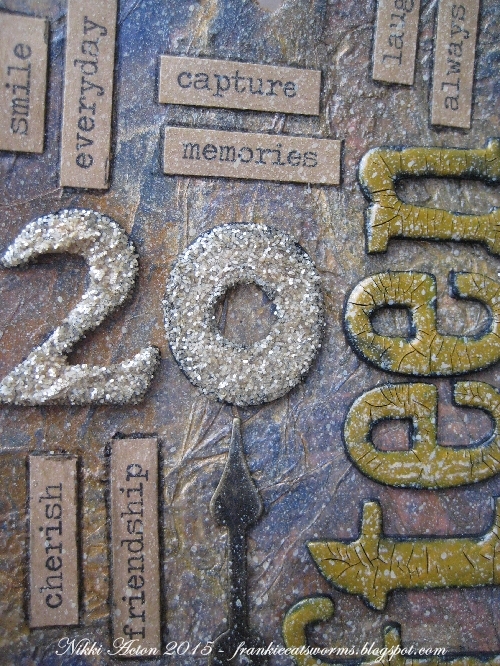 Time for my Tim Tag for January - really enjoyed this one particularly my background which I fear may be slightly lost in photography! 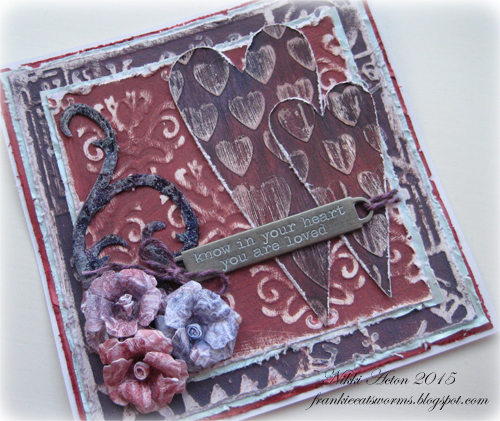 I used a previously messed up tag (with texture and reds!) 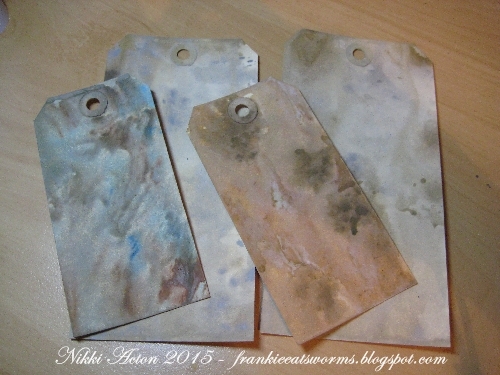 to cover in tissue and then got playing with distress paints and sprays - including my favourite - tarnished brass. Am late to the party this month which means we don't have long to wait for the February one - yea! Hi everyone, hope you had a lovely weekend. 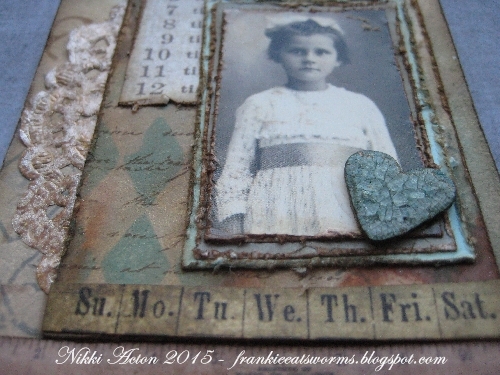 I am sharing this project over at Country View Crafts today. 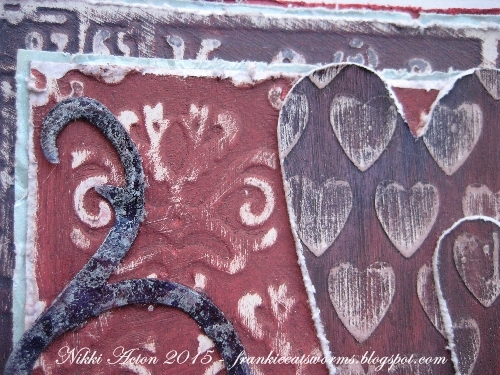 Fresco paint brayering and lots of yummy stencils! Do hop over to take a peek at the details. I am still not back in full flow after my holiday - glad this was another project I had prepared in advance! Creativity been zapped by a virus. Thanks for looking today and for your lovely comments. Good morning (in the UK) and happy Saturday everyone. Today I would like to share a romantic little card with you - not sure why I have gone all feminine and floral of a sudden - but enjoyed making it all the same! Quite a large card for me too - about 7'' x 7''. 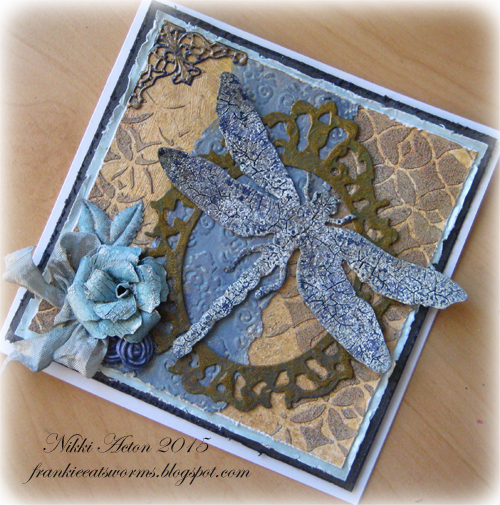 The background was embossed card with a little heart stamped in scattered straw randomly and then tarnished brass distress stain over the top. 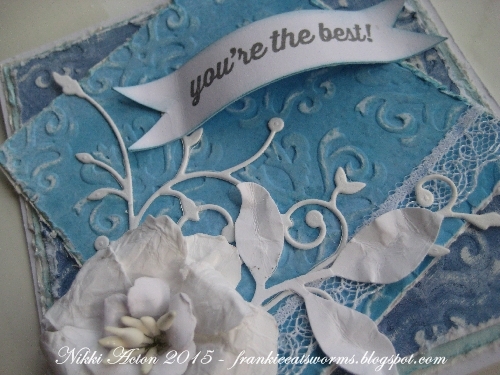 The pink hidden layer was embossed with a clocks folder and gesso added. Once dry a little aged mahogany DP added before sanding back. 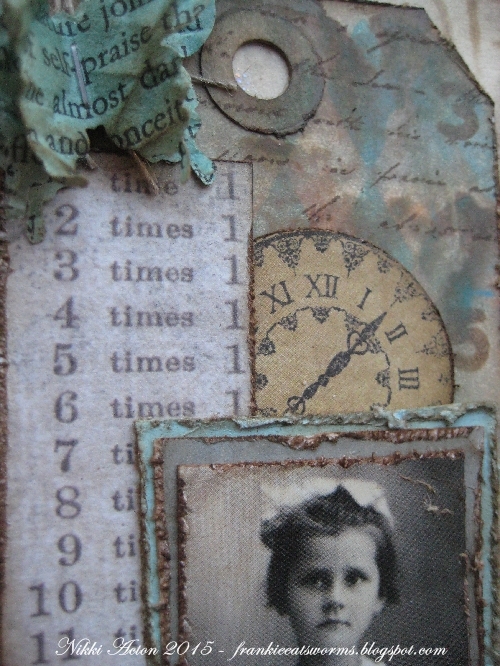 The torn pieces were a patterned resist paper I stamped over with a creative expressions clocks stamp and then I wiped the surface to reveal the resist. My clock is by Cheery Lynn - although I kept the centre intact. I covered with tarnished brass crackle paint and once dry added black soot distress stain and heated. My flowers are the poinsettia creative expressions die. 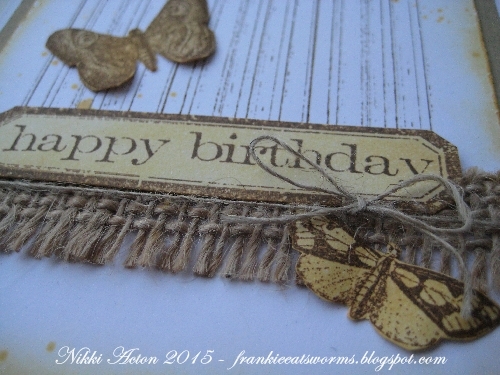 I prepared my card by wetting and scrunching and leaving to dry before die cutting. 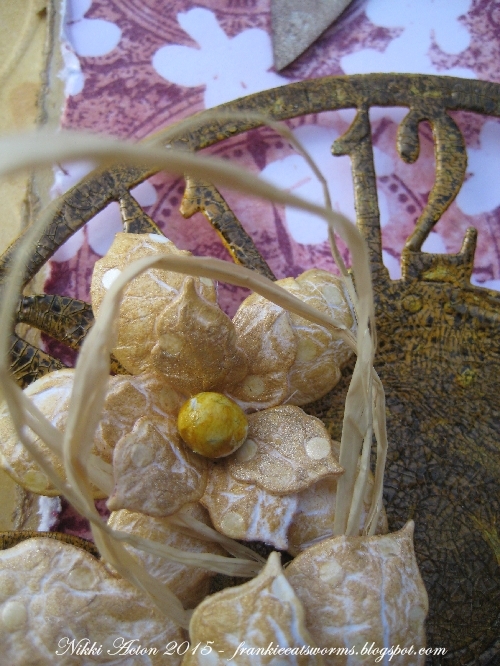 I then lightly inked with tarnished brass distress stain before creating my flower.I added a raffia bow and the centres of the flowers are balls of air dry clay coated in tarnished brass crackle paint. 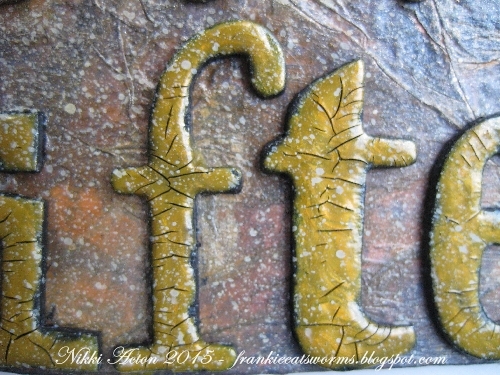 The letters are also air dry clay - covered in aged mahogany DP and a little gold embossing powder added. 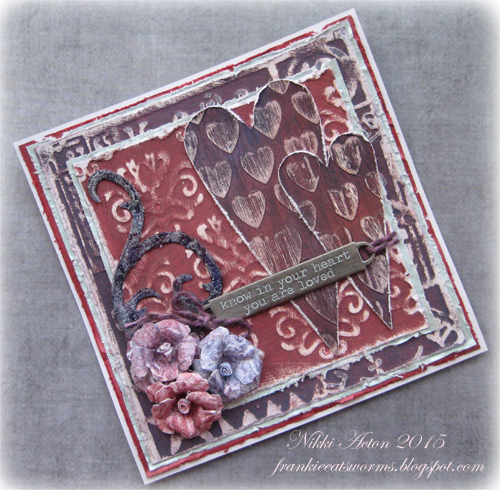 My hearts are tando pre cuts - with tarnished brass distress stain added. 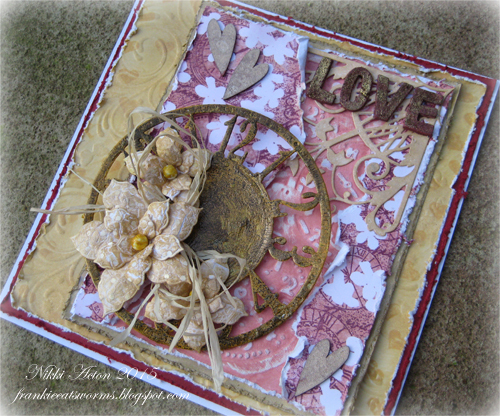 Time for a new challenge over at A Vintage Journey today where the theme was chosen by Astrid and is 'Love is in the Air'. 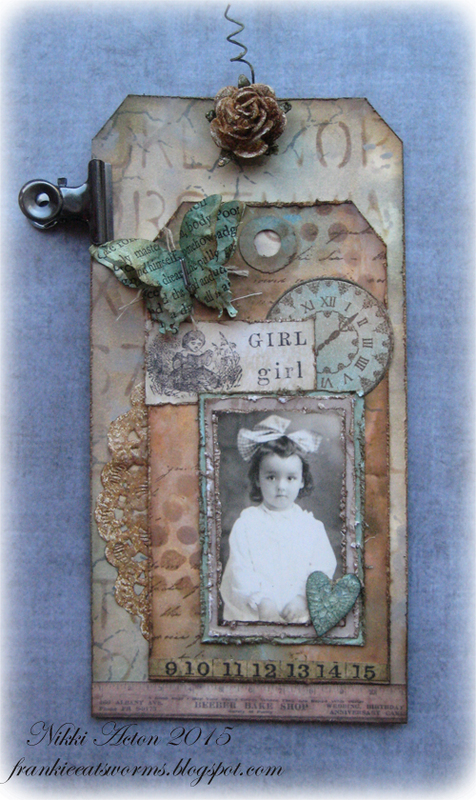 I chose to take a slightly more feminine route for this one using embossing folders and distress paints. 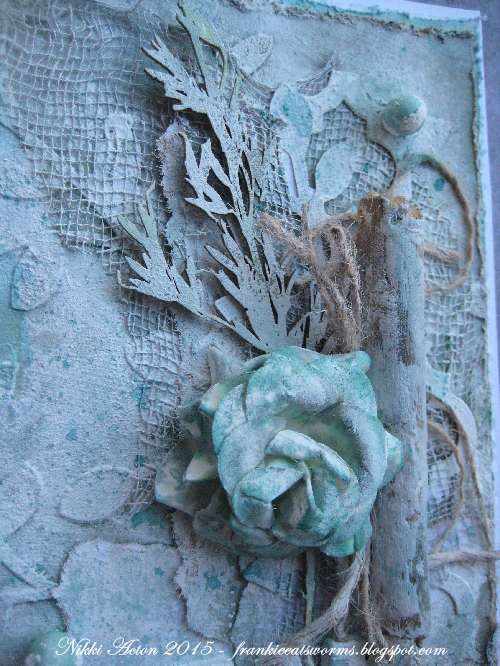 Both the two layers and the hearts were first embossed with various embossing folders before being painted with gesso and once dry, various distress paints. 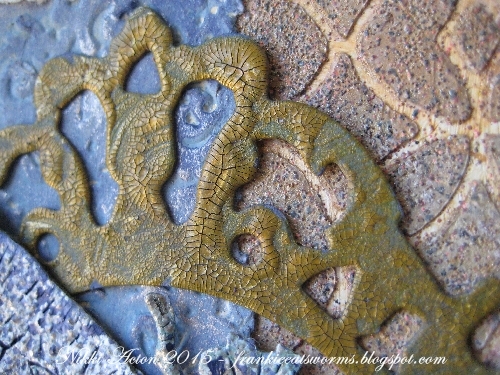 Once dry I sanded back to reveal the embossed surface. 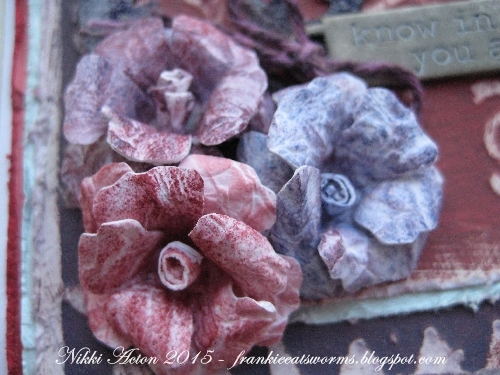 My swirl was painted with colour and then crackle paint.The flowers were made with the smallest flower from the tattered florals die. I wet and screwed up some white cardstock and once fully dry I die cut and then lightly sponged over with distress inks before creating the flowers. My metal tag was covered with picket fence distress paint and after a few moments the surface wiped clean leaving the paint in the text to dry. 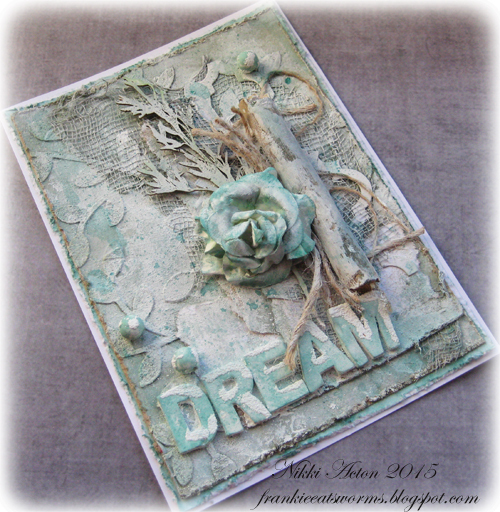 A Vintage Journey celebrates the inspiration of Tim Holtz - do pay a visit and play along with us. 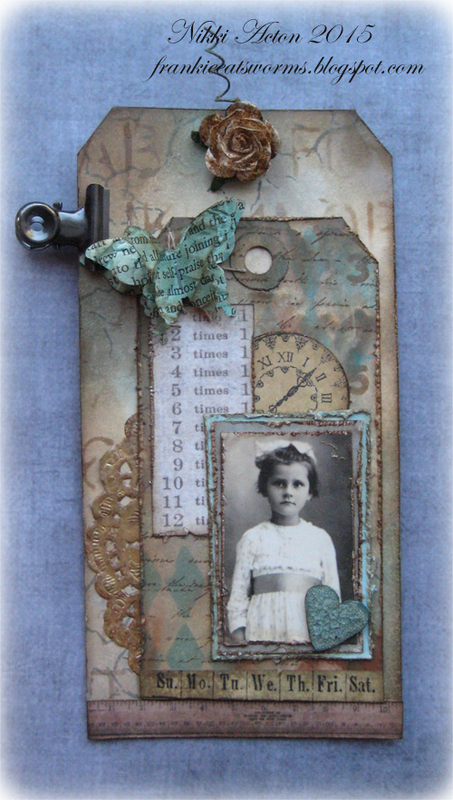 You do not need to use Tim Holtz products just take some inspiration from his ideas, techniques or products. 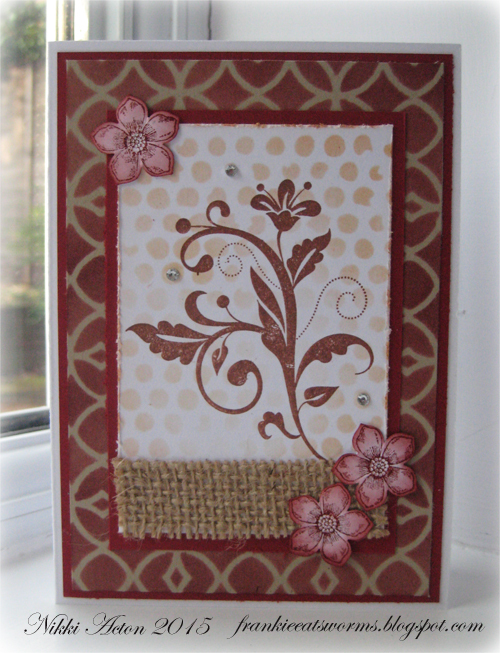 This is my second make for the current Country View Crafts challenge - to Use Something New. There is still plenty of time to join in! 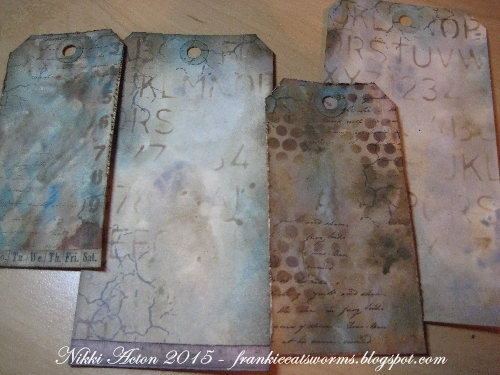 I used more of my new layering stencils and also I am slowly increasing my range of distress paints and have included these too. 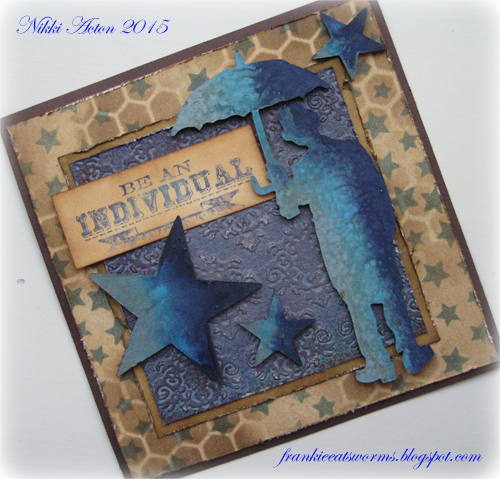 My Tim Holtz honeycomb and Stampin Up star stencils have been used on the background with my favourite combinations of blues and browns. 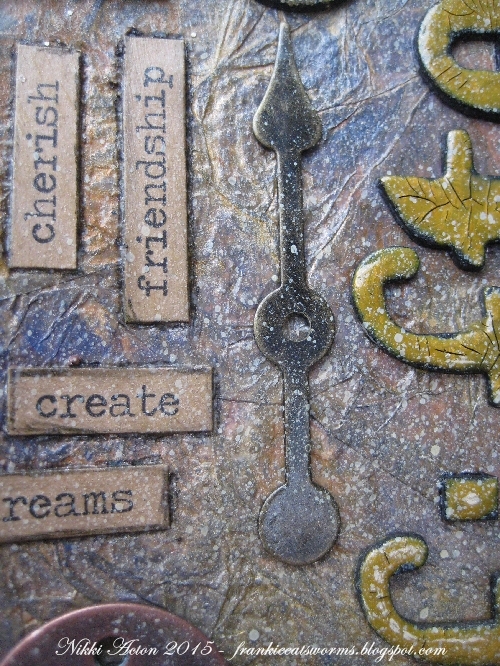 The centre is an embossed and painted panel with a little treasure gold added. Umbrella man and the stars have been dabbed with 3 colours of distress paint and spritzed with water to allow the colours to blend. Oh I do love umbrella man! We are adding some fabric at Try it on Tuesday for the latest challenge. ( Ribbon doesn't count though!) 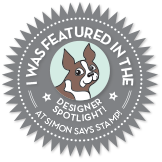 Do hop over to join the fun and see what I expect will be some great inspiration from the team. It is good to be back! 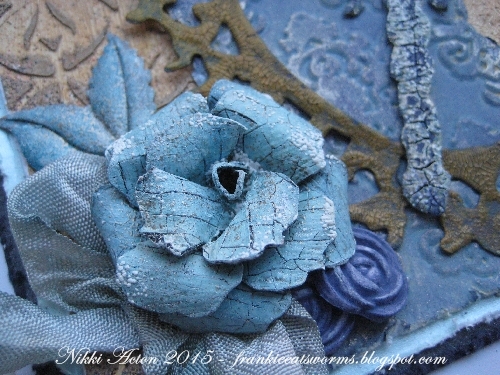 I have been away for a couple of weeks and seem to have missed so much - both in blogland and at CHA. Had a wonderful time in South Africa but missed my crafting. A big hello and thank you to my new followers - I really appreciate it. I have had some wonderful comments over the past couple of weeks too - thank you very much. 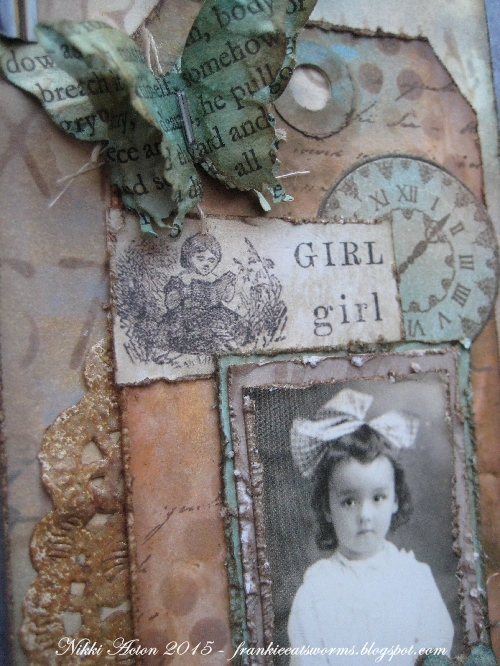 So I have been working on a new style for me - a little more shabby chic. It is hard for me not to get out the browns and blacks but quite pleased with this. Like so many others I have been having problems with photography in the UK winter light so my photos look at little eratic. 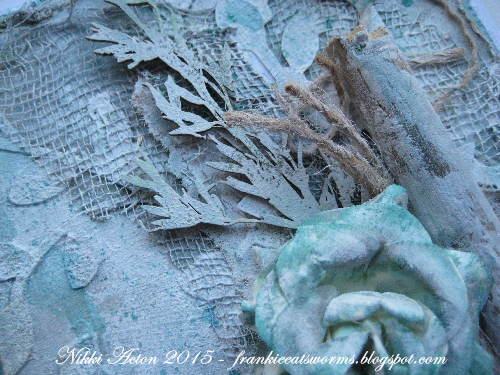 I think the photo at the top gives the truest colours - I used iced spruce and watered down evergreen bough to create my wintery, frosty card. 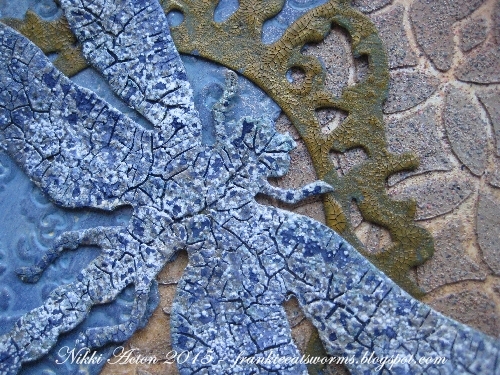 I started with a stencil and texture paste to create the backgrounds leaves. Lots of gesso, lots of layers, more gesso and random inking! Thanks very much for visiting - back tomorrow with something a little cleaner! Good morning everyone. 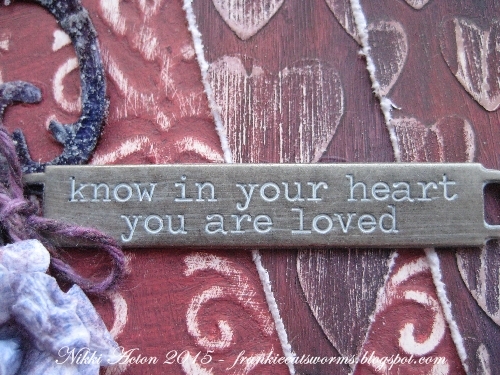 I am sharing this project over at Country View Crafts today where there is a full step by step. Do pop over and take a peek! I loved making this - a new style for me - a year ago I could never have imagined me making flowers ( bit of a tomboy really!). 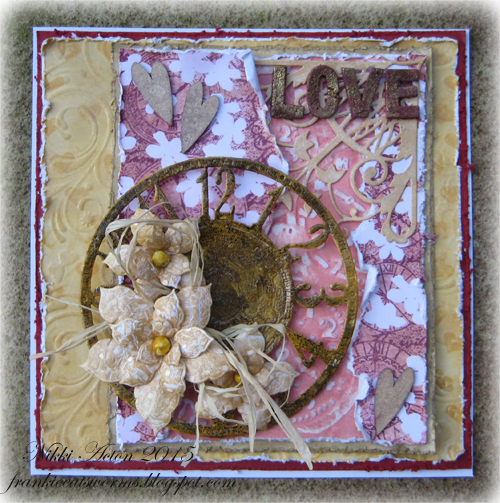 I was inspired by the fabulous Christmas card I received off Pamellia at My Little Craft Things. 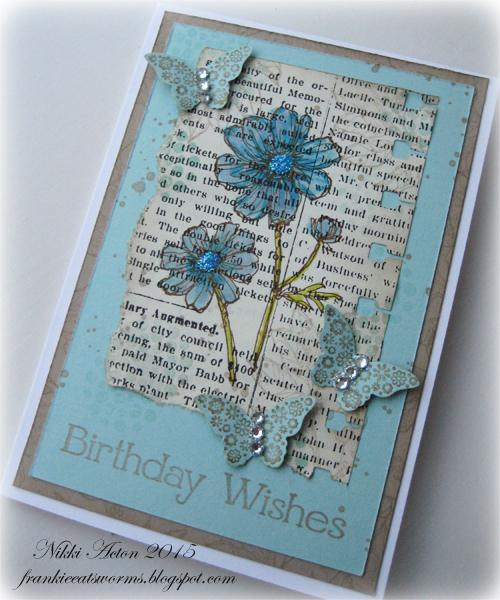 This is the card I received - do visit her site if you haven't been there - her work is beyond stunning. Hello everyone. My posts are scheduled at the moment while I am on my hols - so if I haven't been to visit you in a while it is because I am without an internet connection. Be back soon! 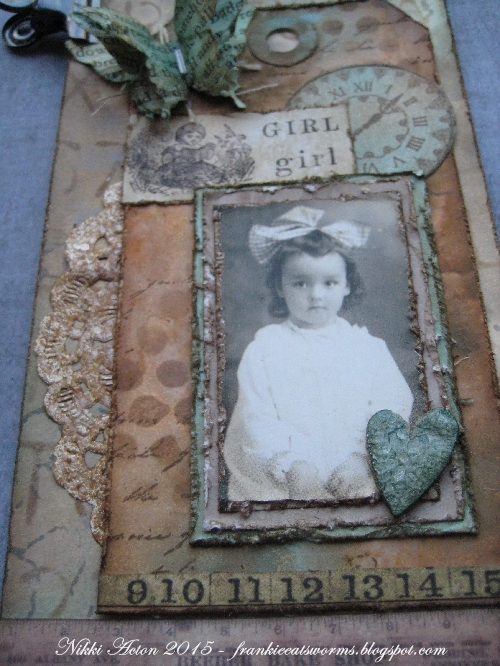 The challenge starting today at A Vintage Journey is to 'Use a Portrait' - any portrait will do. 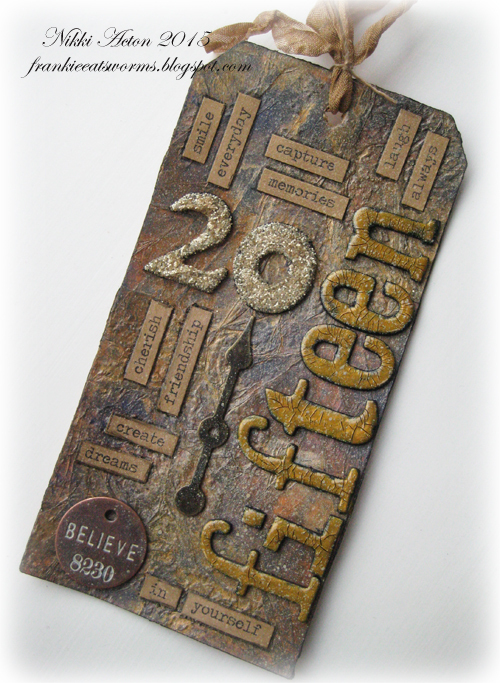 Our Tim Holtz inspired challenge does not mean you have to use his products just to be inspired by him. I used some 'Found Relatives' images for my tags. I got a little carried away making these so forgot to take many photos - whoops. 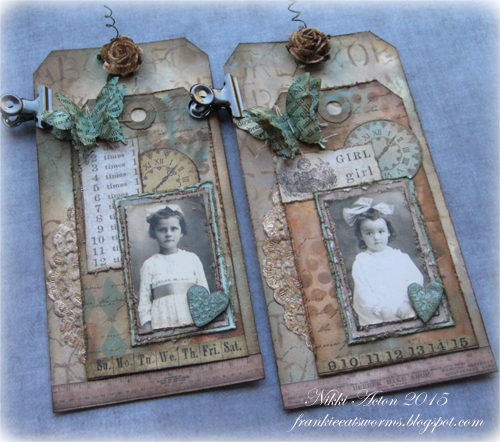 I started with some mop up tags I found on my desk! They would have been from distress paints ( have I told you how much I love them!). 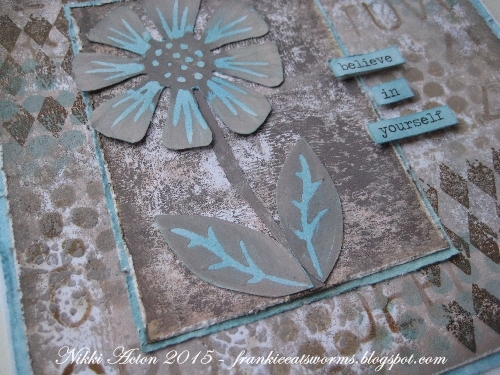 I then proceeded to add some background interest with stamping and stencils. I focussed on letters and numbers as I had the theme of the two young girls in my mind, learning and developing - they reminded my of two sisters. I am afraid that is where the process photos stopped. 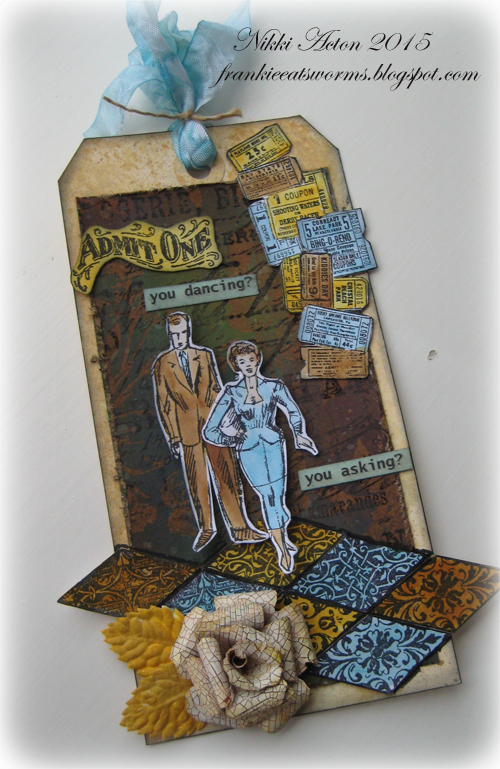 I selected some elements from Tim's paper stashes to go on my tags and played around with collage layouts for quite a while. All my final bits were distressed and inked at the edges. 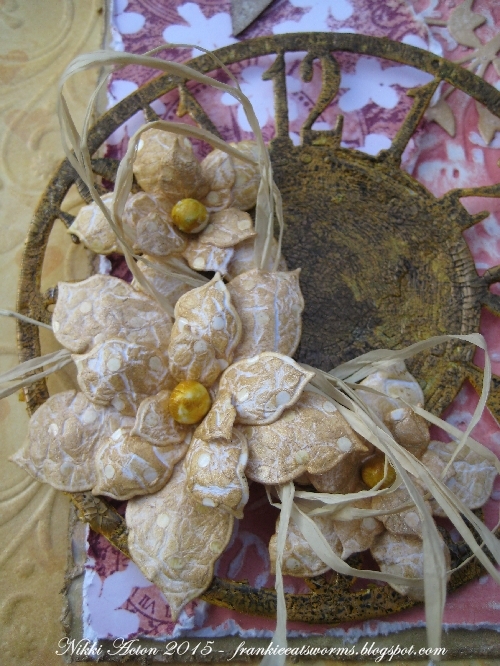 I took a doily and coloured it with tarnished brass distress paint too. 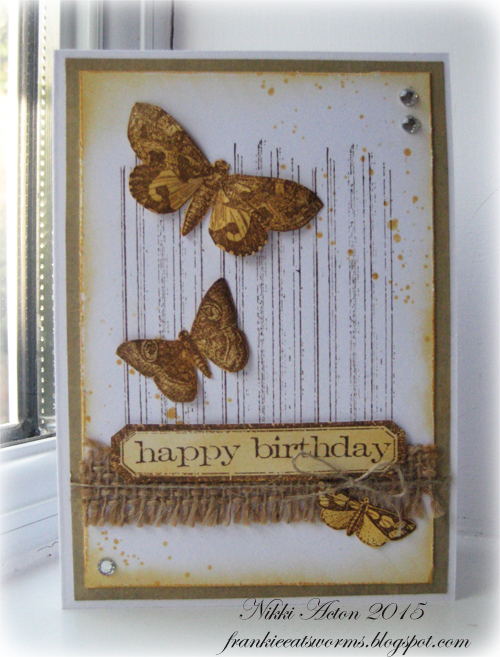 The butterflies are punched using a Stampin' Up punch. I took an old book page and coloured it with broken china distress ink before scrunching it up and punching them out. 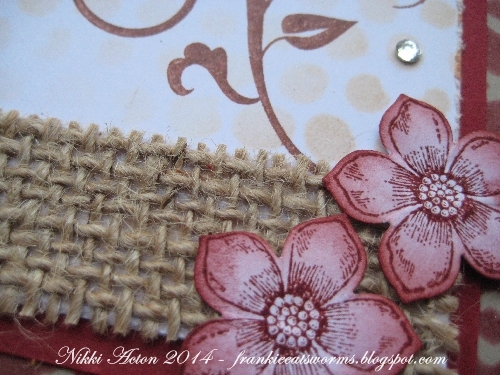 I stapled 3 together on each tag and added a little linen twine. My flower is a bought one which I sprayed with distress sprays. I coiled the wire attached to the flower and placed it through the tag hole. The little hearts were coloured with broken china and rock candy crackle added. 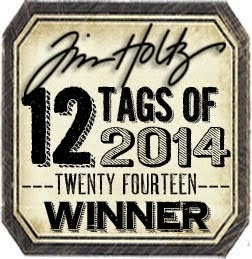 And that is my two tags! I hope you like them. Time for the first challenge of 2015 at Try it on Tuesday and we are using our Favourite Things. 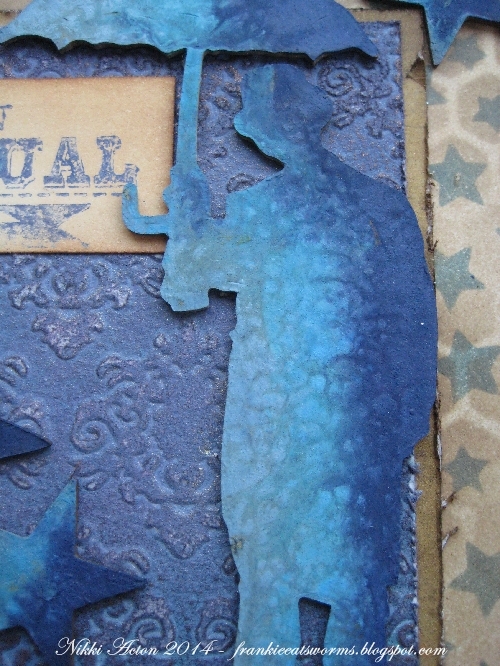 I have too many favourite things so thought I would focus on my layering stencils - which I love in all sorts of projects. This really is quite a feminine little card for me. 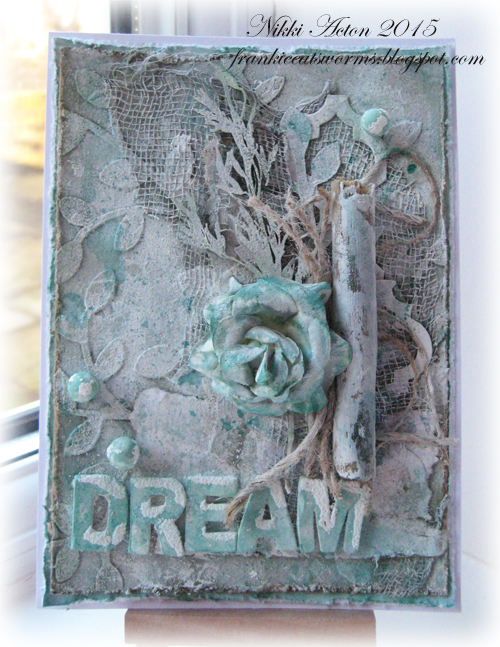 I have used two Tim Holtz stencils here - Latticework and Bubbles. 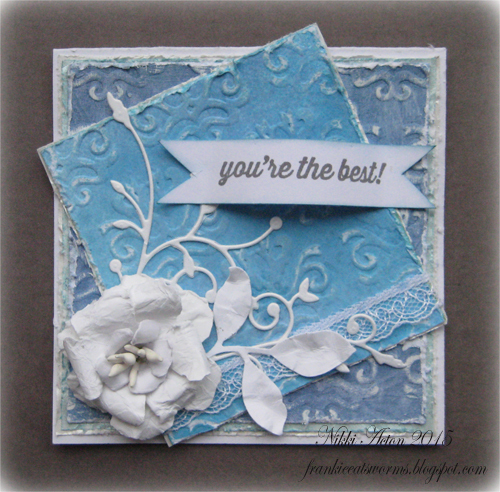 I added the lovely Stampin' Up flourish and petite petals. 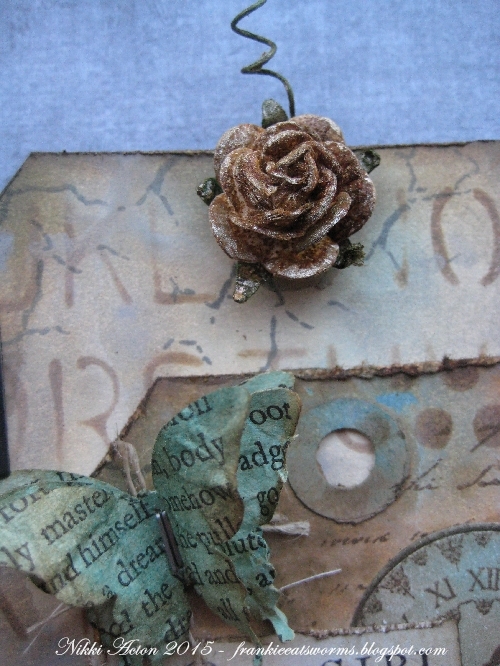 The colours are Tim Holtz tattered rose and aged mahogany. Hi everyone. 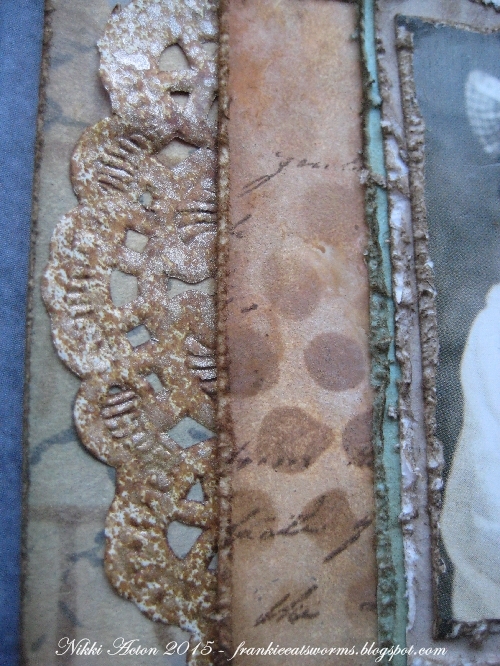 I have been playing with a few new products and lots of textures. Actually it is a mixture of new and old on this card. 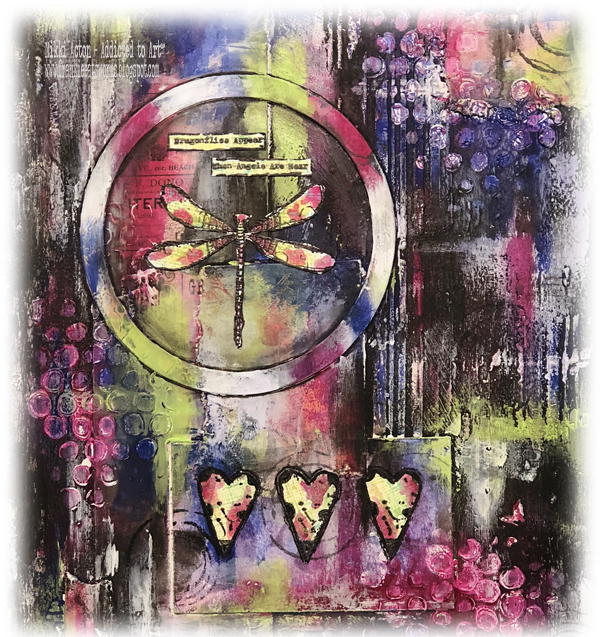 The poor dragonfly has been sitting on my desk for a few weeks and has been altered and altered, I am surprised he is still in one piece - I think all the layers of paint and crackle and embossing have made him stronger! My large flower has come off an old project ( I have been having a sort and throw away session!) 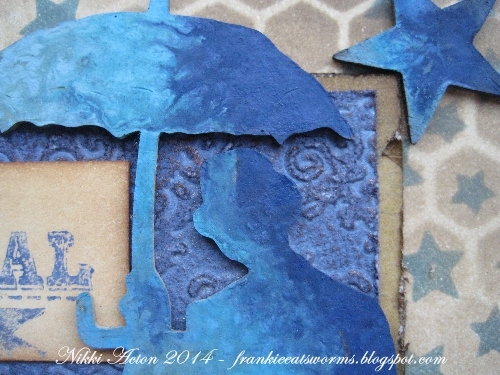 but I added a little embossing powder and changed it's colour too. The frame is new (love it) and the tarnished brass crackle paint that covers it.